Marty Burken has spent nearly all his life on the family’s dairy farm. His parents, Loren and Betty Burken, established Blue Hyll Dairy Farms in 1965 with 100 cows, and it was the perfect place for him to nurture his love for animals. He loved cows then, and he still does. It’s evident in every aspect of his family’s dairy operation. Although Marty and his brother, Mike, went off to college at Iowa State University, they both soon returned to their farming roots. They bought the family farm and dairy in 2000 and continue to grow the operation. Their success centers around a straightforward philosophy of sustainability, and it’s a mission they’ve mastered. Sustainability can take on many definitions for different people. For Burken, it’s a trifecta of wisely using precious natural resources, providing comfort for the cows, and caring for his family and community. Today, Blue Hyll operates with 1,200 cows and about 12,000 gallons of milk leave the farm every day. Every 15 minutes, 44 cows are milked. Technology and state-of-the-art facilities have the dairy running efficiently – much to the owners’ and cows’ satisfaction. Within 48 hours, fresh and wholesome milk from Blue Hyll operation can be found on grocery store shelves and in schools. Some of the dairy’s milk even shows up in store coolers – ready for purchase by shoppers – the same day it was milked from the cows. When it comes to food, it doesn’t get much fresher! Recently, Blue Hyll completed a $6.5 million expansion featuring a 1.3-acre cross-vent barn. On one side of the barn, 44 fans continuously draw air across the barn. With a 7-mph wind, the barns are up to 10 degrees cooler than anywhere else outside. Beyond increased air flow, sprinklers are continuously misting the cows with water as they eat. Once the water evaporates from the cows, they are misted again. The evaporation process takes heat away from the cows, an important step in their comfort. Curtains have also been installed on the barn, which are automatically lowered to keep the sun’s hot rays out in the summer or to tame winter’s bone-chilling winds. It’s important to keep cows comfortable so they maintain an adequate diet. In many ways, heat has the same impact on cows as it does people. When heat stress is high, appetites decrease. Burken chuckles a bit when he says he takes better care of his cows’ health than his own – in reality, he’s not joking. On Mondays, a veterinarian is onsite at Blue Hyll viewing the herd, doing pregnancy tests and conducting health and wellness checks. Every two weeks a nutritionist comes to the farm and assesses vitamin and mineral levels and energy and protein levels in the feed. The feed is constantly being sampled to make sure the cows’ diets are correct to maintain production and for the overall health of the cow. The cows all wear Fitbit-type technology that measures their food intake and other vital signs. 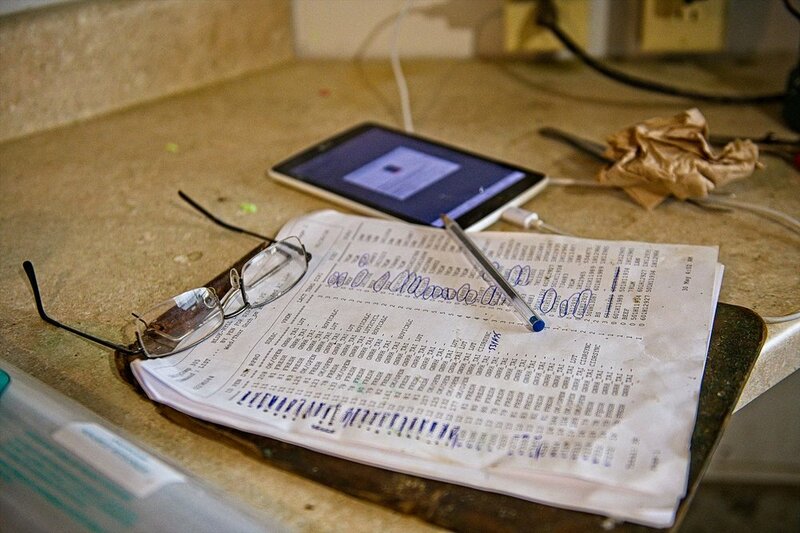 With technology playing a critical role in his operations, Burken says about 50 percent of his days are spent at the computer analyzing data. Environmental sustainability is a cornerstone of Blue Hyll’s operations, and the dairy has won several awards for being excellent stewards of the land. In particular, water is their top natural resource. At Blue Hyll, 60,000 gallons of water are used per day and the water is recycled four times. First, well water cools the cows’ milk from 100 degrees Fahrenheit to 55 degrees Fahrenheit. Second, cows drink this water and it also mists them when the weather’s hot. Third, it’s used to “flush” the barn floors. This wastewater is then captured and the solids are separated from the liquid. The resulting nutrient-rich liquid, is used as fertilizer for fields and gardens. And, finally, the water is used for a fourth time when injected into the field to reduce odor. Blue Hyll remains a family-oriented operation. 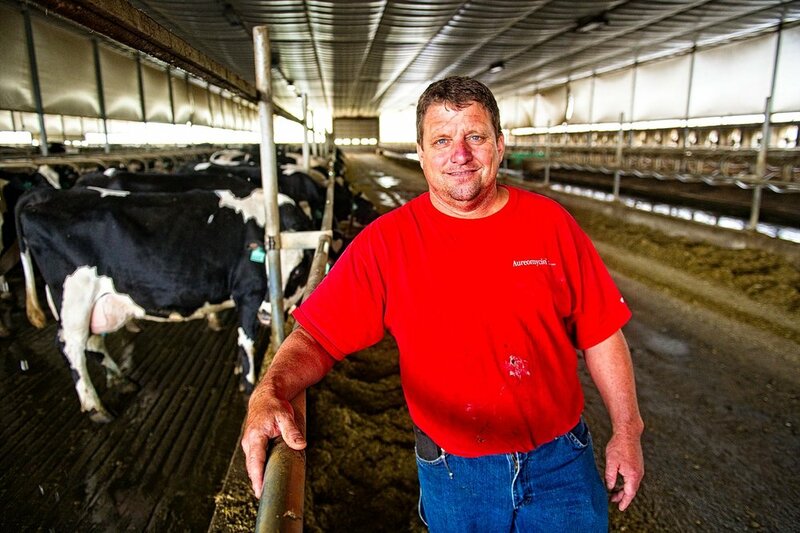 Marty’s brother Mike runs the crop side of the dairy, overseeing approximately 4,000 acres of cropland on the site – 50 percent of which ends up as nutritious feed for the cows. Although his parents sold the farm, it’s not uncommon to find his dad, Loren, helping out on the farm. Burken's daughters, Hannah, Haley and Hillary also help out with various aspects of the dairy and farm. In fact, Hannah and Haley are former County Dairy Princesses and are attending Iowa State University and the University of Iowa, respectively. Youngest daughter Hillary spends most of her summers – by choice – at the dairy farm. “She is really interested in genetics, and I could definitely see her returning to the farm one day,” Burken says.